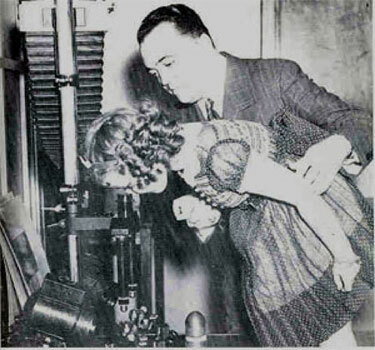 Does this picture have J. Edgar Hoover and Shirley Temple doing a bullet comp? A prosecutor takes exception to a defense ballistics guy saying higher definition imaging improves accuracy in bullet and rifling comparisons. The guy states that crime labs have not adopted newer tech and still rely on 1930’s comparison microscopy. He also admits he knows of no one who has validated his claims of higher accuracy. Note: The term “unique” gets heavily used by the prosecution’s expert. Hmm. Any validation for that Mr. Prosecutor? Are any of these suppositions true? Or false? In a lawyer-like critique, lawyers gotta remember it takes more than just the expert’s favorable opinion about your case. The bitemark crowd banked on opinion only for decades and see where THAT got them. The expert needs (or at least should in a perfect legal world having trained “gatekeepers”) data and empirical testing as foundations. It’s telling that the DA is using a cross-ex thread that often is used against prosecution experts. This case generates some other questions. What is the standard of care for doing these side-by-side 2D observations? Does it vary across the world? What’s the minimum equipment and presentation testimony? What are the limits? Are there documented cases of false positives (Type 1 error) and false negatives (Type II error?)? A newer version but still just a visible light scope. Also……. Aren’t bullets cylindrical? Courtroom exhibits are always flat. What’s the rest of the patterns look like when compared? Here’s a “100” per center compared to a maybe “0” percenter? This entry was posted in Uncategorized and tagged ballistics, bullet comparisons, CSI, Forensic science, National Commission on Forensic Science. Bookmark the permalink.